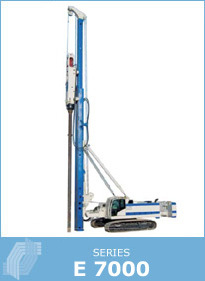 A complete range of pile driving rigs suitable for the application of hydraulic or diesel impact hammers to drive prefab concrete piles and steel piles. True to Enteco's multi-purpose philosophy, E7000 series can also be equipped with Rotary Drives, for the construction of bored piles, CFA piles, Soil Displacement piles, Double Rotary piles, Down the Hole piles, Soil Mixing piles and with Diaphragm Wall-grabs. The design and geometry of the E7060 allows for wide angle mast inclinations to drive raked piles. An exclusive patented Enteco system prevents the wire ropes from exceeding the permissible fleet angle when driving raked piles in any inclination. The mast forward travel allows for easy positioning on the driving spot. The frame of all models is designed to attach two outriggers to increase the stability of the machine and the thrust on the tool.